Tim Johnson became the first to pedal up the the 7.6-mile road to the summit of Mt. Washington in winter, conquering ice-covered pavement, gusting winds and a relentless grade while also reaching some profound emotional depths. Even in August, Mount Washington in upstate New Hampshire is not a place to trifle with. “The Rockpile,” as it is known can—due to its exposure and its situation at the confluence of two major storm tracks—be erratic and dangerous. Though a mere 6,288 feet above sea level, the highest peak in the Northeast is as unpredictable as a Vegas blind date. Come winter, Mount Washington unveils a dark side that borders on sinister. There have been nearly 150 recorded fatalities on its flanks, including deaths of hikers, skiers, and motorists. 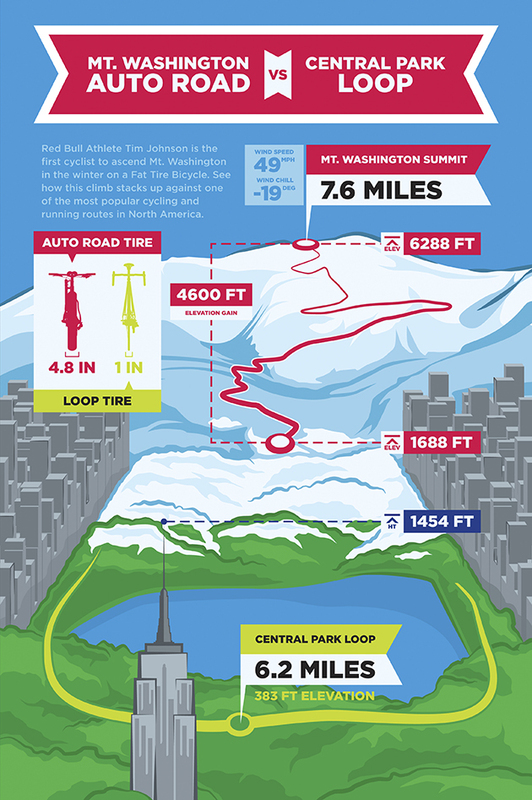 Which makes cyclist Tim Johnson’s ride to the summit aboard a fat bike in early February—the first ever mid-winter, two-wheeled ascent of Mount Washington—all the more impressive. As a six-time national cyclocross champion, Johnson admits bad weather is his stock-in-trade. But few cyclocross venues can match the Mount Washington Auto Road for sheer, throat-tightening anxiety. The 155-year-old Mount Washington Auto Road—billed as “America’s First and Oldest Man-made Attraction”—rises 4,270 feet from Pinkham Notch to the summit in a mere 7.6 miles. During the summer months, the road is open only four days to cyclists, during the venerable Mount Washington Auto Road Hillclimb and Newton’s Revenge (a race added to accommodate the overflow from the Hillclimb), and two practice days. Johnson has raced the Auto Road Hillclimb six times, winning twice, in 2000 and 2001 (the latter in a personal best time of 53 minutes, 31 seconds). Nine years after his second victory, Johnson was back in Pinkham Notch, supporting another Red Bull athlete, rally car racer Travis Pastrana. On a clear September day in 2010, Pastrana charged up the Auto Road aboard his souped-up Subaru WRX in a then-record time of six minutes, 20.47 seconds. But seeing Pastrana’s performance got Johnson thinking about tackling The Rockpile in a different way. That meant a different season. 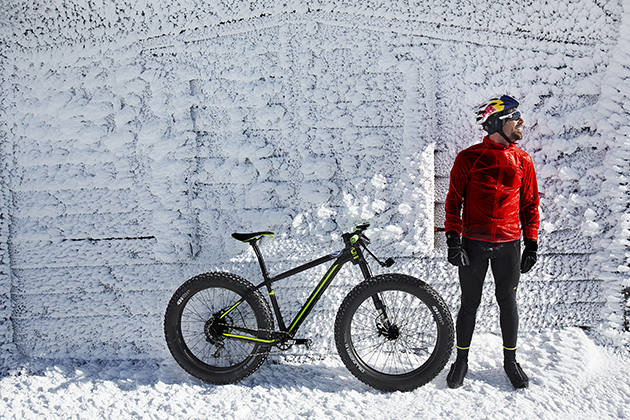 Advances in fat bike technology—spawned by adaptations employed during Alaska’s epic IditaBike race—made the idea of a winter ride even more compelling. Johnson and his team had willing partners at the Auto Road and the state’s parks department. Mother Nature was less inclined to play along. The Red Bull crew had targeted early February for Johnson’s bid. In late January, however, the mountain was socked in beneath a low-pressure front, which brought high winds (an average of almost 50 mph, with gusts exceeding 125), biting cold, and precious little visibility. However, a staffer at the Mount Washington Observatory kept Johnson’s team apprised of weather updates, and reported that Tuesday, Feb. 2, might bring a favorable change. Fortunately, the prediction held, as a high-pressure front brought milder temperatures (about 30 degrees at the base), lighter winds, and cerulean skies. Johnson rolled up to the starting line at about 9 a.m. Unlike Pastrana, who had 400 horsepower to work with in his Subaru, Johnson could call on only the power produced by his legs, lungs, and heart. His rig was a 29-pound modified Cannondale Fat CAAD 1, outfitted with lightweight carbon wheels and 5-inch tires. Each tire was perforated with 258 carbide studs to add some bite on the boilerplate ice that covered portions of the road. When the ice wasn’t a solid sheet, it was corrugated ripples left from the SnowCoach tracks. While the uneven surface would have been a nightmare for a typical road bike, or even mountain bike, it turned out, Johnson says, to be a blessing for him. “The cat tracks were a salvation, because I knew I would get traction,” says Johnson. “That’s where the singletrack feel comes in. If you were to get my actual path that I rode on, I was back and forth, one side of the road to the other, all the way up. If I didn’t do that, I would fall over. Above treeline, wind also played a significant factor. The average wind speed was roughly 30 mph, with gusts upwards of 50. During a reconnaissance outing, Johnson’s Red Bull camera crew got a rude welcome from The Rockpile. Despite having a solid support crew, Johnson knew he was solely responsible for getting to the summit. “If I did have a crash that turned into a slide off the top of the mountain, I knew that I’d probably end up OK, because the [SnowCoach] was there," he says. “But you never know. It’s as close as we get to mountain climbing on a bike. There’s also an undeniable mental component to any Auto Road ascent. The pitch, ranging from an average 12% grade to a ridiculously steep 22% at the summit, is unrelenting. Around each of its 72 corners, the road continues to climb. There are no flat sections, no plateaus, for recovery. Combined with the ubiquitous winds above treeline, the road is an immense test of fortitude. Typically, a race like the Mount Washington Auto Road Hillclimb demands a strict regimen focusing on training and preparation, allowing competitors to keep emotions in check. But the Mount Washington ride, with “so many variables, so many unknowns,” was far less predictable, says Johnson. The winter ride took him on an emotional rollercoaster that he hadn’t anticipated. It brought him face to face with his father. Roger Johnson passed away in 2008, “in the middle of my career, and just after a real reconciliation after we had been apart for a while,” says Johnson. 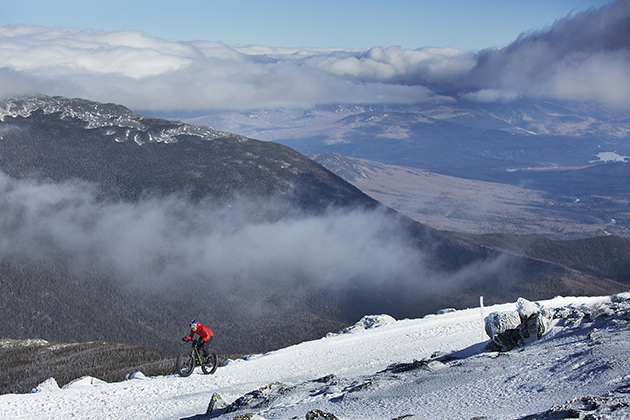 Unlike the mid-summer Auto Road Hillclimb, Johnson’s mid-winter ascent wasn’t a competition against other riders. The elements, and Johnson’s motivation, were worlds apart. Johnson reached the summit less than two hours later. His official time was one hour, 45 minutes and 48 seconds. Subtracting the time required for photo shoots, gear adjustments and a bathroom break, Johnson estimates his riding time was roughly one hour, 33 minutes. 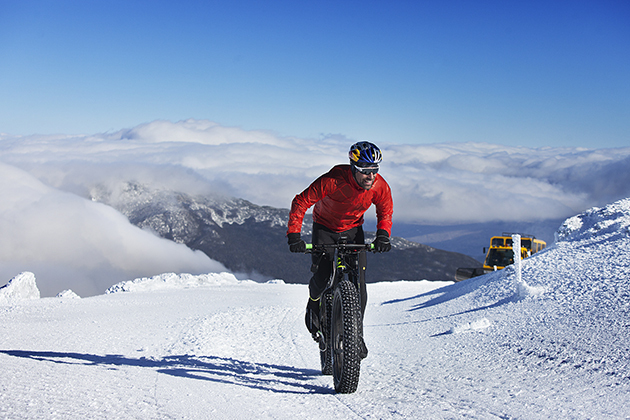 After finishing, the rider pedaled around the summit on his fat bike for a few more photo opportunities. Johnson then took a moment to look out over Wildcat ski area to the east, to remember his father, just as a large cloud descended on The Rockpile, creating a blinding white-out. “I could hear the photographer yelling, ‘We're done,’” he says. “Yup,” replied Johnson, with a big grin. He had done what he came to do.